In mentioned in an earlier post that in the last little while I've helped some girlfriends organize their kitchens. It was a lot of fun for me. Hopefully for them too. I love the feel of an organized and uncluttered space. It makes me feel peaceful. I haven't always been that way and there are still spots in my home that need organizing, but I'm working on it. I have found there are two things that contribute to clutter. First, we have way too much "stuff" or multiples of everything. And second, we try to store all the excess in a space that's too small. 1. I consider my kitchen a "working" space, not a storage space. That means I only have in my cupboards (or my main cupboards) those things I use every day or week. Everything else is stored either in my downstairs storage room or in low or high cupboards that are awkward to get into. 2. I keep items closest to where I will use them. My friends were amazed at how a little rearranging could save so much time. For example, the oven pads and mitts ago in a drawer next to the oven. 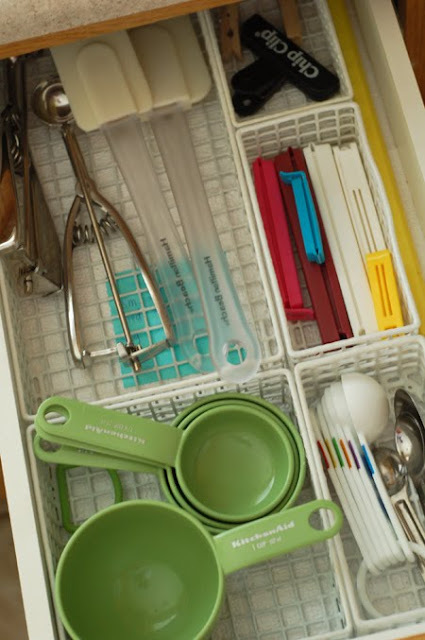 The silverware drawer and plates, cups and bowls are in the cupboards nearest the dishwasher so it can unload quickly. 3. I set up a baking center so I can stand in one spot and have access to all my baking supplies, tools and ingredients. This corner of the kitchen is my baking center. 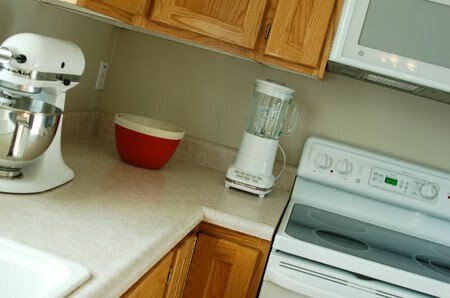 It makes sense to have it near the stove, oven and microwave and to keep my Kitchen Aid mixer on the counter. That's one appliance I wouldn't want to do without. I love it and use it a lot. In the cupboards above the counter I have my baking ingredients. The first basket contains basics like baking soda, baking powder, vanilla, etc. I just set it out on the counter when I'm making cookies or muffins and then stick everything right back in when I'm done. The second basket holds a variety of nuts. The third basket is molasses and Karo syrup. Come to think of it, I haven't used those items in forever, so I'm going to get rid of them. The half full container on the top shelf is the last of the honey my sister-in-law shared with me years ago. Her dad, Virg Marshall, used to keep bees when they lived in California and it is the best honey. I save it for the good stuff. I love these cupboard stands because it really bugs me to have things stacked so I have to lift one thing to get to another. I was just thinking those stands might work great for my studio cupboards too. 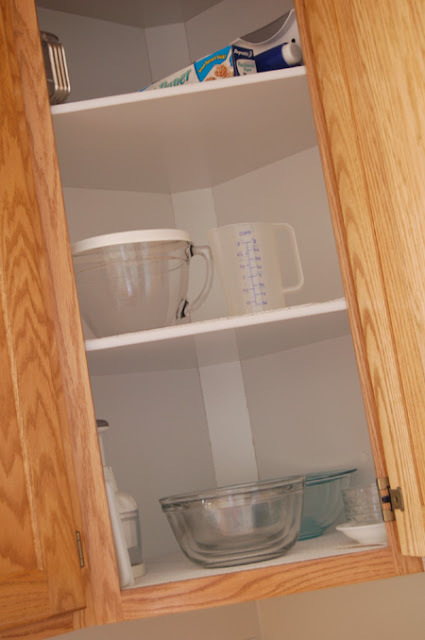 In the corner cupboard are my baking supplies: bowls, measuring cups, food chopper, etc. I know it seems bare, but honestly, these are the only items I use often. Next to my hand food chopper, I keep my small cutting boards because I always use those two items together. On the top shelf is a sifter, parchment paper and cookie cutters. I don't use those items as often, so I don't want them taking up prime real estate. 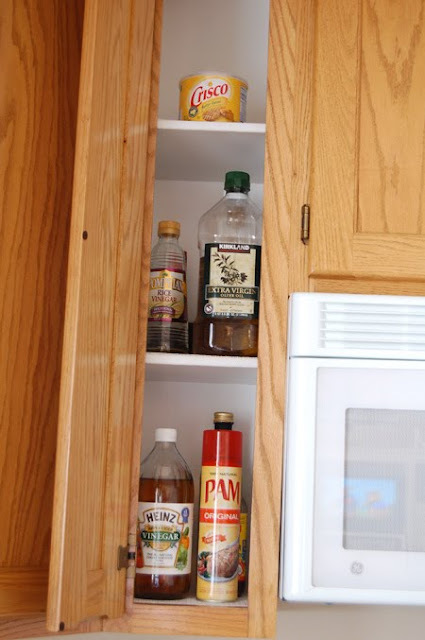 In the tall cupboard next to the corner cupboard is where I keep my various oils and vinegars. I use them a lot. In the drawer below the counter are my baking tools. I usually have my mini spatulas in there too, but they're in the dishwasher right now. Below the drawer is my slotted cupboard with my cookie sheets, jelly pans, muffin tins, etc. My casserole dishes, bread pans and bundt pan are in the drawer underneath the stove. Behind me on the pantry door are all my spices. The rack is an old video holder. I don't think they even make them anymore. 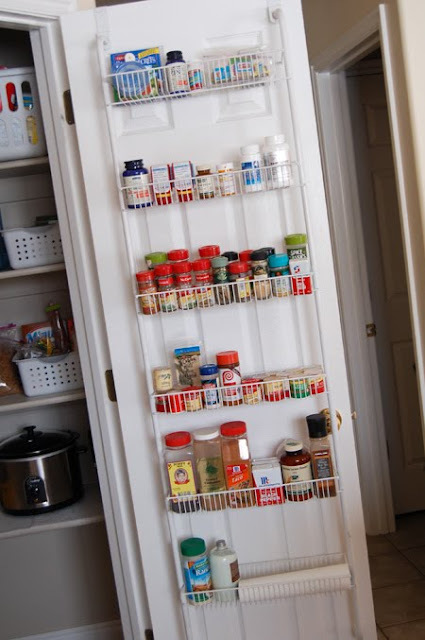 I saw something similar at Walmart in the kitchen section, but it doesn't have as many shelves so there are huge spaces between the bottom two. Almost forgot. My flour and sugar are in glass jars in my pantry. Not super convenient, but I'd rather not have them on the counter. All in all, I have things pretty pared down. But the area is easy to keep organized because there isn't a bunch of excess to deal with. If you're serious about getting organized, I highly recommend the book Organizing from the Inside Out by Julie Morgenstern. I found it interesting when she talks about the psychological reasons for staying disorganized. It really got me thinking. I've learned that just like everything else, being organized is a process. My biggest hurdle right now is the paper stuff. I've got some systems that are working and some I need to change. I just keep plugging away. Thanks for the reminders and tips! I've been cleaning out all my kitchen cupboards and getting organized. I was starting to loose momentum. Thanks for the shot in the arm! This is such an ongoing project for me ONLY because people in my house who put things away, don't put them in the right places. I was going to do a super overhaul last spring break, and then in the summer, and then over Christmas break...I guess I better get to that soon. Oh, how we miss that honey! We do have the last of the 60 pounds (still good and sweet) but it's in the food storage supply now. He sure misses his bees. Now, I'm not picking on you, but where is your apron? I have gotten into aprons in the last few years and love them - store purchased and hand made. Ask Deanna to show you the one I made her for Christmas. I hope they're not just for 'old ladies' any more! Great ideas in this segment, Kim. 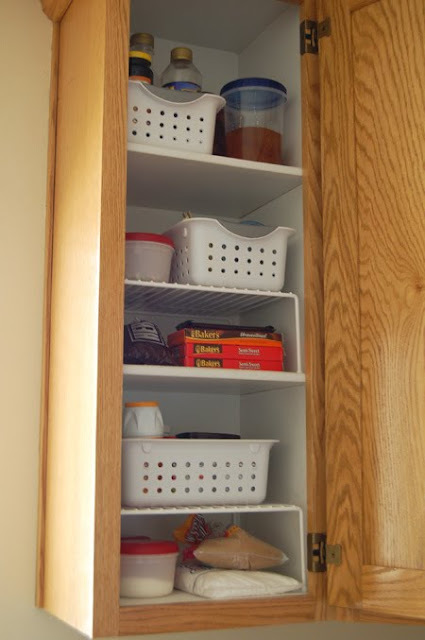 Will you show food storage sometime? I promise we live here! :) I guess that's the first step to simplifying, looking at what you really USE each day/week and getting rid of or storing away what you don't.